NW: You are a natural competitor, what was behind that decision and how challenging has that been? Kevin: The decision was easy, I wanted to prove that you can look good and proportionate and still be competitive. Even if you have to work harder, you can do it. But it’s definitely challenging. My body stays pretty lean naturally and I’m really wanting to put on more muscle- that’s been difficult. 2011 was my rookie year, so this is my first off season, so I’m not really sure where I’ll be at once I trim down. NW: Do you think beginning your bodybuilding career after the age of 40 has been a blessing, a curse, or both? Kevin: It’s definitely been a blessing. I had no idea I would have so much success my first year. It’s been really cool to inspire others- especially my classmates. They see some of my photos and they say, “You have an 8 pack??? ?” I just hate hearing people say, “I’m too old” or “I’m too heavy” because I know anyone can do it. So, hopefully the people that I motivate will take action. NW: Looking back over 2011, what were you dissatisfied with, that you plan to change this year? Kevin: LOL, well I hope this doesn’t get me in trouble, but honestly I was not happy with my 3rd place finish at WA States last July. I feel I should’ve placed better. But I didn’t, and going forward I really want to put on a few more pounds of muscle. NW: How has your family shaped who you are? Kevin: My Dad was very athletic and competed in multiple sports. He got me into track- hurdles and decathlon, and in a way I was racing against him. My Dad had the hurdles record at his high school in Hawthorne, CA and it was cool that I also had the hurdles record at my high school, Lake Stevens. When I ran at Western, I was ten years older than everybody. I was 28 and I won the 110 hurdles and 400 hurdles for the league, and then I won the 110 hurdles at regional’s. My Dad was there every step of the way. Every meet, he was there. I guess he helped me believe in myself and I’ve always felt like I have another level in me that I have yet to achieve. NW: What was the greatest advice you ever received? Kevin: I can’t say it was really advice, but more like comments that have stuck with me. My high school track coach Jeff Page would often tell me that when I focus my mind on a goal- with my determination, I will reach it. He recognized my ability to put away distraction and completely focus and achieve whatever it is I went for. It’s kind of funny. I can remember sitting in the audience with Justin Randall at the 2010 Ironman. I saw Ken Ralston win and I remember thinking, “I want one of those muscle guy trophies.” My first show was Tanji’s Vancouver show. I won 1st place in my class but I received a marble obelisk. I won overall and received a sword. It was great but I still wanted that dang muscle guy trophy, and wasn’t stopping until I got it. I got it my next show with my 3rd at Emerald Cup. 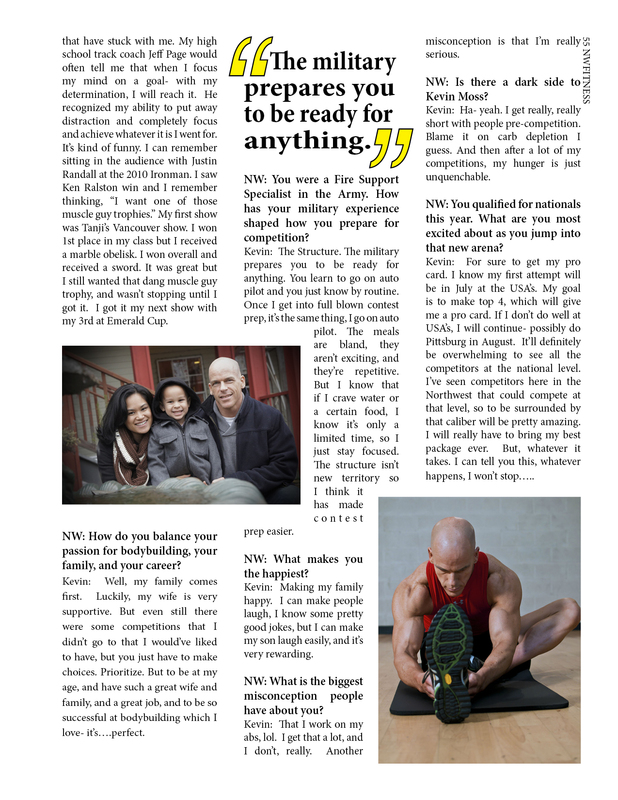 NW: How do you balance your passion for bodybuilding, your family, and your career? Kevin: Well, my family comes first. Luckily, my wife is very supportive. But even still there were some competitions that I didn’t go to that I would’ve liked to have, but you just have to make choices. Prioritize. But to be at my age, and have such a great wife and family, and a great job, and to be so successful at bodybuilding which I love- it’s….perfect. NW: You were a Fire Support Specialist in the Army. How has your military experience shaped how you prepare for competition? Kevin: The Structure. The military prepares you to be ready for anything. You learn to go on auto pilot and you just know by routine. Once I get into full blown contest prep, it’s the same thing, I go on auto pilot. The meals are bland, they aren’t exciting, they’re repetitive. But I know that if I crave water or a certain food, I know it’s only a limited time, so I just stay focused. The structure isn’t new territory so I think it has made contest prep easier. NW: What makes you the happiest? Kevin: Making my family happy. I can make people laugh, I know some pretty good jokes, but I can make my son laugh easily, and it’s very rewarding. NW: What is the biggest misconception people have about you? Kevin: That I work on my abs, lol. I get that a lot, and I don’t, really. Another misconception is that I’m really serious. NW: Is there a dark side to Kevin Moss? Kevin: Ha- yeah. I get really, really short with people pre-competition. Blame it on carb depletion I guess. And then after a lot of my competitions, my hunger is just unquenchable. NW: You qualified for nationals this year. What are you most excited about as you jump into that new arena? Kevin: For sure to get my pro card. I know my first attempt will be in July at the USA’s. My goal is to make top 4, which will give me a pro card. If I don’t do well at USA’s, I will continue- possibly do Pittsburg in August. It’ll definitely be overwhelming to see all the competitors at the national level. I’ve seen competitors here in the Northwest that could compete at that level, so to be surrounded by that caliber will be pretty amazing. I will really have to bring my best package ever. But, whatever it takes. I can tell you this, whatever happens, I won’t stop…..